Amid the growth of educational services and content on the Internet, it is expected that an increase in services with material suited to the path of learning and systems that bundle materials together. There is research being done on ways to systematize connections between preparatory and review items and to coordinate the content of educational materials. The authors have developed Rikamap(“Science Map”:http://www.nhk.or.jp/school/rikamap/), an application that utilizes resource description frame-work (RDF)-formatted learning paths to connect these stages of learning and systematically organize and present educational video content relevant to each stage for the user. 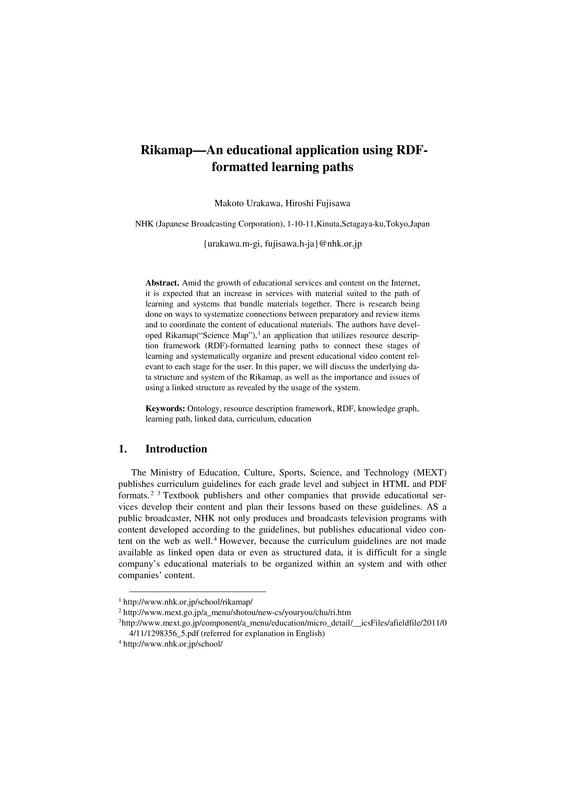 In this paper, we will discuss the underlying data structure and system of the Rikamap, as well as the importance and issues of using a linked structure as revealed by the usage of the system.